Create your favorite smoky eye with these eight blendable shades of our highly pigmented PurePressed® Eye Shadow. Long-lasting, crease-resistant finish. Mirrored compact and dual-ended brush. Create your favourite smoky eye for every event of the season with these eight blendable shades of our PurePressed Eye Shadow. 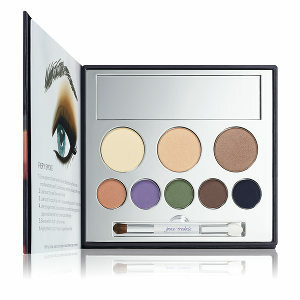 Highly pigmented for long-lasting color and a crease-resistant finish. The artful travel box contains a mirror and dual-ended brush with a simple how-to guide for five gorgeous holiday looks. Three effortless smoky eye looks using our In Jane Iredale The Blink Of A Smoky Eye collection. Each finished with Jane Iredale Forever Red Lip and Cheek Stain a non-drying, long-lasting, all natural stain that adjusts to your own chemistry for an irresistible shade that will flatter your skin’s undertone.